In order to be reinstated to the bar and regain custody of her daughter, hotshot lawyer Cate McCall (Kate Beckinsale) � sober, in recovery and on probation � reluctantly takes on the appeal of a woman who claims she was wrongfully convicted of murder. LOS ANGELES � May 15, 2014 � For Immediate Release � Doing the right thing may get her killed in The Trials of Cate McCall , appearing before the judge on DVD and VOD May 27 from Vertical Entertainment. 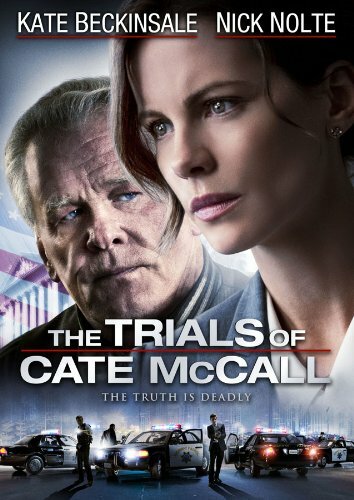 In order to be reinstated to the bar and regain custody of her daughter, hotshot lawyer Cate McCall (Kate Beckinsale, Underworld: Evolution, The Aviator, Underworld, Pearl Harbor) � sober, in recovery and on probation � reluctantly takes on the appeal of a woman who claims she was wrongfully convicted of murder. Indifference soon gives way to determination as she uncovers a web of deceit and corruption that extends to the most powerful echelons of the police department � But it�s her word against theirs and she may not live to tell the story. A gritty, suspense-filled thriller with an all-star cast, also including Golden Globe-winner Nick Nolte (Tropic Thunder, The Thin Red Line, The Prince of Tides, Cape Fear, 48 Hours), James Cromwell (HBO�s Boardwalk Empire, FX�s American Horror Story, The Artist, I Robot, The Green Mile, L.A. Confidential), Clancy Brown (Starship Troopers, The Shawshank Redemption), Taye Diggs (ABC�s Private Practice, Chicago, Equilibrium), Kathy Baker (13 Going on 30, The Cider House Rules, CBS� Picket Fences, Edward Scissorhands) and Mark Pellegrino (The WB�s Supernatural, TNT�s The Closer, ABC�s Lost, National Treasure, Lethal Weapon 3, The Big Lebowski). Based in Santa Monica, Calif., Vertical Entertainment was founded in 2013 by entertainment industry veterans Rich Goldberg and Mitch Budin and has quickly become a notable force in indie film distribution for theatrical, television, DVD, VOD and digital platforms. With a focus on family fare and theatrical genre films with A-list casts in the $5-10 million budget range, the company plans to release up to 24 films a year.� High-profile titles acquired to date� include The Hot Flashes, starring Brooke Shields, Wanda Sykes, Virginia Madsen, Daryl Hannah, and Camryn Manheim; Scenic Route, starring Josh Duhamel and Dan Fogler; Rushlights with Josh Henderson, Beau Bridges and Aidan Quinn; the animated Freedom Force, voiced by Sarah Michelle Gellar and Christopher Lloyd; and the 3-D animated film The Snow Queen, based on the Hans Christian Andersen fairy tale and produced by Timur Bekmambetov.